This unusual looking species is native to the western US (CA, ID, MT, NV, OR, WA) and Canada (BC). In British Columbia, it is primarily found in the southwestern corner of the province, where it has been collected most frequently on eastern Vancouver Island. There are reports from the area north of Kamloops, and the Sicamous area. It may be overlooked in some areas. Candystick is an erect perennial rhizomatous clonal species 10-50 cm tall with scale-like leaves and single, often multiple, unbranched stems. Stems arise from "a diffuse, deep-seated root system bearing branch roots and adventitious buds at intervals along its length" (Lichthardt and Mancuso 1991). Seeds are tiny (1 mm), with more than 100 per seed capsule, and are wind-dispersed. Plants persist after seed dispersal. Deer have been observed browsing this species, and may play a role in seed dispersal (Bureau of Land Management 2010). 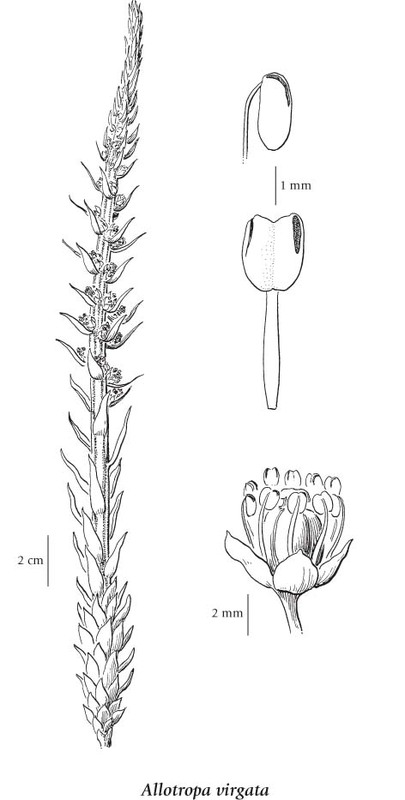 Candystick is a member of the Monotropoideae--the subfamily of plants within the Ericaceae that lack chlorophyll. It is mycotrophic, and obtains its food from mycorrhizal fungi that are associated with nearby coniferous trees (sometimes hardwood trees (Lichthardt and Mancuso 1991)). In BC, it has been found in mesic to dry Douglas-fir forests in the lowland and montane zones at elevations of 30 to 900 m on nutrient poor sites. In the US, it is commonly found in lodgepole pine-beargrass communities on granitic soils but has also been found under ponderosa pine, subalpine fir and western red cedar (Lichthardt and Mancuso 1991). Although not documented, it is possible that this species may exhibit dormancy and flowering stems may not appear every year--like other members of the Monotropoideae which can remain dormant for up to thirteen years (Bureau of Land Management 2010). Perennial herb from a rhizome; parasites on mycorrhizal fungi associated with trees; "stems" erect, simple, 10-50 cm tall, 4-10 mm thick, glabrous, white with red or maroon stripes; persistent after seed dispersal; lacking chlorophyll. Linear-lanceolate, scale-like, 20-35 mm long. Inflorescence a spike-like, densely-flowered, terminal raceme, 5-20 cm long (about half the length of the stem); flower stalks erect; corollas cup-shaped, the petals 5, white or pinkish to brownish, about 5 mm long; calyces generally absent, rarely 2-4 sepals; stamens 10, exserted, purplish, anthers without awns. Capsules, nearly globe-shaped, up to 5 mm wide. Petals are often incorrectly described as sepals. Stem and leaves can be considered part of the inflorescence. Mesic to dry forests in the montane and lowland zones; infrequent in extreme SW BC; S to MT, ID and CA. Lichthardt and Mancuso (1991) provide the following write up on similar species: "Allotropa may be confused with other non-green members of the heath family which often share the same habitat. Pindrops (Pterospora andromedea) has sticky, brown flowering stems that also dry and persist a long time after dying. Unlike Allotropa, its flowers face downward, born at the ends of delicate, reflexed pedicels. It is generally much taller than Allotropa (3 dm to over a meter). Pinesap (Hypopitys monotropa) is similar in height to Allotropa, but is uniformly pinkish to straw-colored, drying to black. In flower the main stem bends over (nods) distinctly, but straightens again as fruits develop. Some non-green orchids, especially coralroot (Corallorhiza spp. ), are sometimes mistaken for Allotropa. Coralroot has slender stems, rather variable in color from purplish to reddish-brown to albino. However, stems do not bear the small, pointed leaf blades always present on Allotropa." A shade-intolerant, submontane to montane, Western North American parasite distributed more in the Pacific than the Cordilleran re­gion. Occurs in cool temperate and cool meso­thermal climates on very dry to moderately dry, nitrogen-poor soils (Mor humus forms). Its occurrence decreases with increasing latitude, precipitation, and continentality. Sporadic in open-canopy Douglas-fir forests on water-shedding sites. Commonly associated with Hylocomium splendens and Pleurozium schreberi. An oxylophytic species characteristic of moisture-deficient sites. Bureau of Land Management. 2010. Vascular Plants: Allotropa virgata Information Page. The Survey and Manage Program of the Northwest Forest Plan. US Department of the Interior. Lichthardt, Juanita and Michael Mancuso. 1991. Report on the Conservation Status of Allotropa virgata (candystick) on the Nez Perce National Forest. I. Field Survey and First- and Second-year Monitoring Results. Conservation Data Center Nongame and Endangered Wildlife Program November 1991, Idaho Department of Fish and Game.